Description: NS 11V speeds west with a pumpkin running elephant style. Description: NS SD70 2509 leads a westbound trailer train as Amtrak P42DC 202 changes tracks just outside of the station. Description: CSX CW44-9 #9031 light with sister #7375 keep NS SD70 #2509 and her westbound coal freight company as they wait for clearance on the IHB mainline. 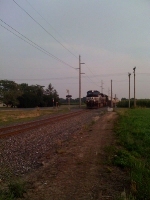 Description: A nice pair of SD70's lead the 20A east at 10:17AM. Description: 18G lead by NS2509 passes Sperry Rial Services inspection truck as it tests the recently reinstalled Track 1 in South Plainfield NJ. Track 1 was placed in service 12/19/07. Description: CP 930 waits in East Worcester at CPF-528 for the northbound 168 to pass before heading down to Binghamton. Description: Behind the VFW, 0750 hours.